Born Robert Stephens, Screechy Dan was performing for crowds as a child in Kingston, Jamaica before making his way to the U.S. and settling in Brooklyn. Red Fox was born Gareth Shelton and raised in St. Catherine, Jamaica perfecting his lyrical skills performing at concerts and parties held at his high school. In 1986, prior to graduating, he migrated to Brooklyn where he started his professional recording career with Peter Mckensie, a veteran dancehall producer and owner of FM Force, an independent label. The rest, as they say, is history for both these artists. Screechy Dan and Red Fox are undeniably two of the most famous dancehall recording artists to come out of Brooklyn. In 1993, Screechy Dan and Red Fox stars aligned when they collaborated on “Pose Off (in ya pum-pum shorts).” The song instantly skyrocketed up the reggae charts and became a staple song in reggae music. 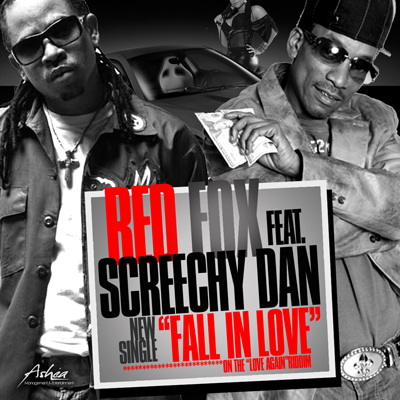 Poised to strike gold again, Screechy Dan and Red Fox have collaborated once again on “Fall in Love,” their new single. This past week both hit the NYC club scene hard to promote it, making stops at Suzie Wong’s, Caribbean City, Negril Village Lounge, Manny’s, Happy Endings, Santos Party House and BB Kings. Descending on the Big Apple like the tornado that hit over the weekend, Screechy Dan and Red Fox sat down with F.A.M.E NYC on Monday to discuss their latest collabo. F.A.M.E NYC: How did the collaboration for “Fall in Love” happen? Red Fox: I did a tour in Germany and while I was in Germany I got a track by a German producer named Sebastian. He has a label called SWS [Sound with Soul] and he presented me with the track and told me he wanted to do a collaboration with me and Screechy. So I did my part in Germany and sent the track to New York and Screechy did his part. F.A.M.E NYC: What drew both of you individually to the song? Red Fox: Well you know me and Screechy did “Pose Off (in ya pum-pum shorts)” and been trying to find that follow up collaboration. We have very good chemistry and felt like that riddim was really us. F.A.M.E NYC: How do you think the listeners have received the single? Red Fox: It’s doing well in Germany, now we’re trying to get it [to] pop off in the States. And so far the reception has been very great. And I think people have been waiting for something like this for the longest time…true reggae fans, people who love to dance with your loved one in the party. It gives the right blend of the old school and I think it will catch you. Screechy Dan: I’ve received the same feedback Fox have. The song has a positive vibe and is a fusion of the old with the new. F.A.M.E NYC: Last week you two appeared at different venues throughout the city in promotion of the single. How do you believe the performances went? Red Fox: They went great, very good I enjoyed every moment of it. The chemistry [onstage] is still there. The crowds were very responsive. F.A.M.E NYC: Do you have any more performances coming up in the NYC area? Red Fox: Not in New York, but I have a show in Massachusetts and Screechy have a birthday party at Caribbean City August seventh. When I think of the word cafeteria, the visuals that come to mind are women in hairnets, greasy aprons, food that looked and tasted unappetizing, rows of tables with trays resting on top of them and dozens of kids prattling away. 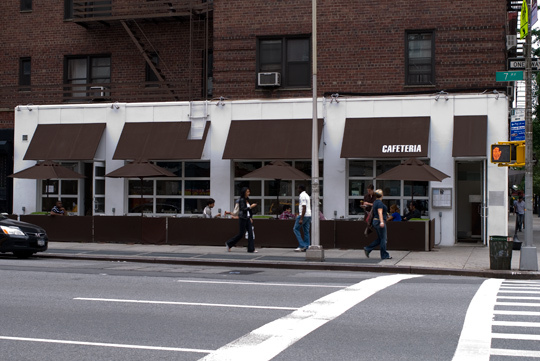 But a visit to Cafeteria, located on 119 7th Avenue, provided a fresh, scrumptious memory and gave new life to a faded term. 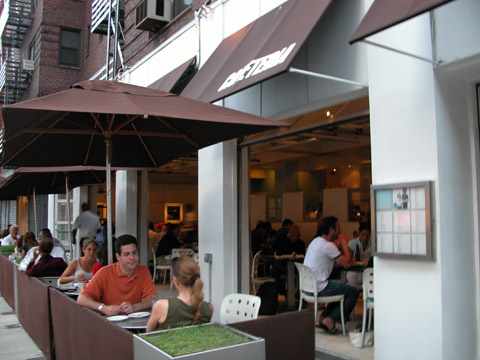 The Chelsea eatery resides on the corner and has an outdoor bistro for patrons who want to dine and soak up the atmosphere of the Village. 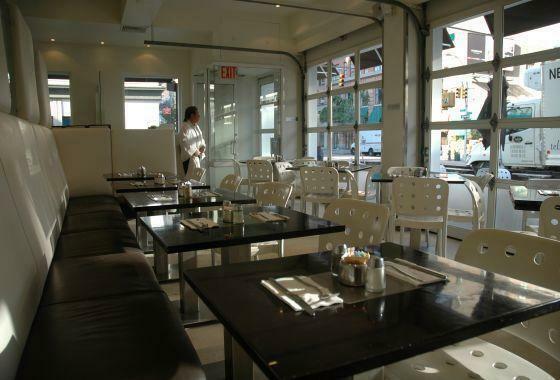 Inside the restaurant possesses a clean, modern aesthetic with comfortable brown benches, white chairs and a bar located towards the back. Candles on the tables offer a dim, intimate look in the evening and the huge windows allow natural light to brighten the space during the day. The food is just as pleasing as the décor and vibe. Open 24 hours a day, seven days a week, Cafeteria offers its customers a lip-smacking selection of breakfast, lunch and dinner dishes at moderate price points. Their silver dollar pancakes served with fresh berries and Chantilly cream is a delicious start to any day. The petite flapjacks are cooked to a golden perfection as well as mouthwatering. The tomato basil soup with grilled cheese croutons is a warm treat on a chilly or rainy afternoon. For dinner, the grilled mahi mahi is an excellent choice; served with crushed avocado, spicy mango chutney, cilantro cream and a crisp tortilla salad this dish has the right amount of heat without being too hot. The meatloaf, served with garlic mashed potatoes, green beans and roasted tomato relish, is a great choice for the hungry man or woman looking fill his or her belly with some comfort food. The portions at Cafeteria are large enough to take a doggy bag with you, and besides serving delectable food, they also present an array of desserts and eclectic cocktails. 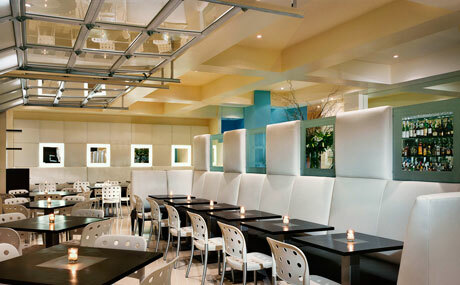 The lunch rooms that I spent my childhood eating in are a far cry from this chic restaurant. FAMERs I recommend giving Cafeteria a visit, they are always open. It is safe to say that 2009-2010 has been the season for Stephen Sondheim on Broadway. His newest production, Sondheim on Sondheim served to be a musical walk down memory lane. West Side Story was a successful revival that brought new and experienced theatergoers to the Great White Way. 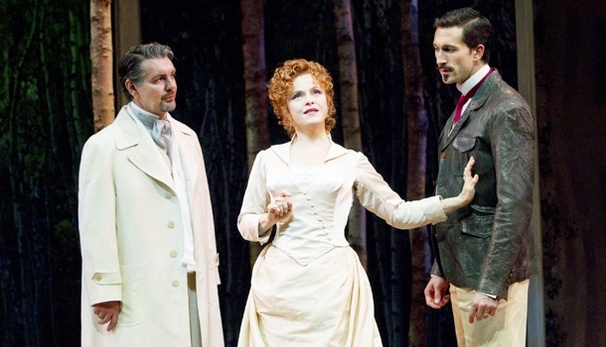 When the revival of A Little Night Music opened in December 2009, the likelihood of its success was undebatable – Catherine Zeta-Jones starring as Desiree Armfeldt, Angela Lansbury as Madame Armfeldt and the music and lyrics of Stephen Sondheim, total no-brainer. Catherine Zeta-Jones, who revealed her singing and dancing chops in the film adaptation of Chicago, won Best Actress in a Musical at this year’s Tony awards. The production was also nominated for Best Revival of a Musical, Best Sound Design and Best Featured Actress in a Musical for Angela Lansbury. The show took a brief hiatus in June after Catherine Zeta-Jones’ and Angela Lansbury’s contracts ended. On July 13 the production resumed with Bernadette Peters and Elaine Stritch portraying Desiree and Madame Armfeldt. With new cast members in place, A Little Night Music turned a page in this revival’s story without losing any of its potency. 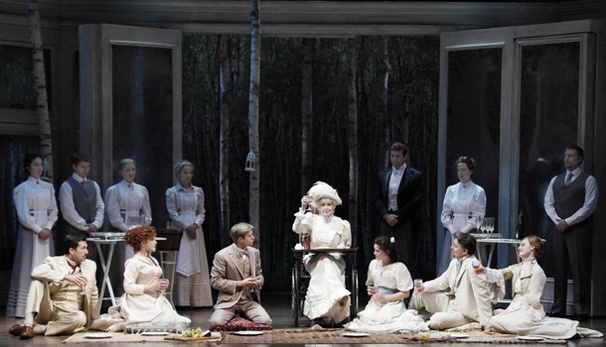 Set in Sweden at the turn of the 20th century, A Little Night Music brings the elegance and sexual repression of the Victorian era to life with the same cultivation as a waltz. With the sparse furniture and rotating sets, director Trevor Nunn shines a spotlight on the undercurrent of love rather than the romanticism that accompanies this emotion. The loss of love…longing…the sport of love…wasted times are all themes that reveal themselves like lit streetlamps at dusk. The sets seamlessly transition from one act to the next and offer a balance as “the young” and “the fools” stumble over self created roadblocks on their trek to true love. The cast carries the melancholy tone that accompanies the story just as beautifully as they deliver the dialogue and musical numbers. Alexander Hanson is enjoyable as Fredrik Egerman, the middle-aged lawyer that had a love affair with Desiree and is now in a sexless marriage with Anne. So clever, he appears to know everything but really knows nothing. Ramona Mallory is delightful as Anne Egerman; the 18-year-old virgin married to Fredrik. She holds her chastity with the same constriction as she holds her secret love for Henrik, Fredrik’s son. As Henrik, Hunter Ryan Herdlicka gives a convincing performance of a young man tortured by desire and morality. The breakout performance is given by Erin Davie. As the Countess Charlotte Malcolm she is jocular and tragic, and comes close to stealing the spotlight from Bernadette Peters and Elaine Stritch. But the combination of Peters and Stritch is hard to eclipse, both are absolutely radiant and can bring all the luminosity of the moon on stage. The real question I had as I waited for the curtain to rise at the Walter Kerr Theatre was if the addition of Bernadette Peters and Elaine Stritch would go over well with Generation X and Y. Both accomplished actresses are Broadway veterans, but box-office superstar Catherine Zeta-Jones and Angela Lansbury (who introduced herself to these age groups while playing Jessica Fletcher in the long-running CBS series Murder She Wrote) are far more recognizable faces. It was Sondheim that suggested Bernadette Peters take over the role of Desiree; his foresight would pay off tremendously for this revival. The role of Desiree Armfeldt was tailor made for Bernadette Peters. She is a Broadway baby literally that can translate the bohemian life Desiree has lead as famous stage actress extremely well. Her presence on stage can only be compared to a breath of fresh H2O. She brings an effervescent charm to Desiree without losing any of the maturity and complexity of the character. Her performance is like sipping a glass of Veuve Clicquot’s La Grande Dame champagne – delectable from beginning to end. She is beyond familiar with Sondheim’s work starring in productions of Sunday in the Park with George, Into the Woods and Gypsy. His music and lyrics and her voice fit like the famous Versace dress Jennifer Lopez wore to the Grammy’s – exposing all the best emotions and features of the other. This pairing comes to a crescendo when Bernadette sings “Send in the Clowns.” The emotion Bernadette delivers exposes the lament in this song so exquisitely that by the last bar my eyes were swelling with tears. 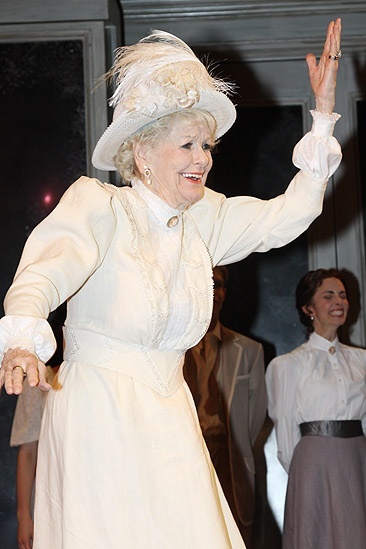 Elaine Stritch is uproarious as Madame Armfeldt; her comedic timing is as infinite as her talent. During the performance Elaine had to have a few lines read to her; her savvy as a comedic actress placed a lovely veil over her forgetfulness. In fact, it added another layer to Madame Armfeldt, a sharp-tongued woman that seems to be stuck in the past. Watching Bernadette Peters and Elaine Stritch on stage together was like unearthing rare gems. My question had been answered; no member of the audience, regardless of their age, could feel cheated if they missed the performances of Catherine Zeta-Jones and Angela Lansbury. 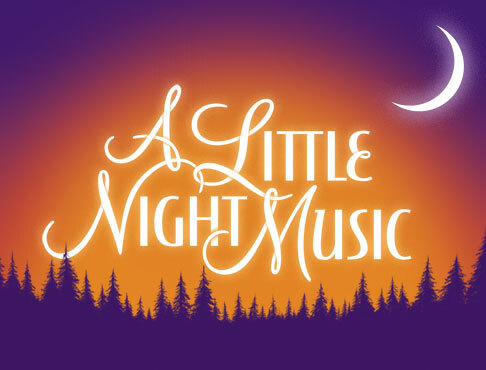 Bernadette Peters, Elaine Stritch and the rest of the cast are worth the price of admission and then some, but despite the celebrities on stage, the eternal star of A Little Night Music is the music and lyrics of Stephen Sondheim. Like the moon, his compositions smile upon us all; it is an essential component in making this revival and any future productions a triumph. 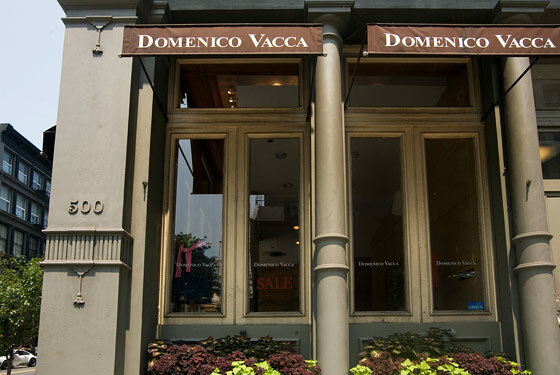 The name Domenico Vacca is synonymous with two things: luxury fashion and A-list clientele. 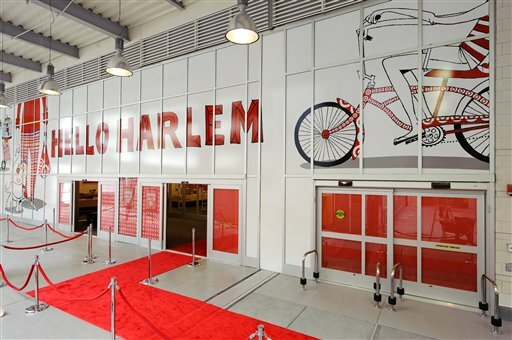 Costume designers love to style Hollywood stars in his clothes and Al Pacino, Ron Perelman, Diddy, 50 Cent, Lebron James, Usher and Scarlett Johansson are among the celebrities that are his loyal customers. The designer known as the official clothier of the red carpet will be using his superior craftsmanship to create a line of high end denim. The men’s collection launches fall 2010 and the women’s collection will follow in spring 2011. Last Friday male models from Models International helped to display the luxury jeans at a private party held at Domenico Vacca’s West Broadway location. 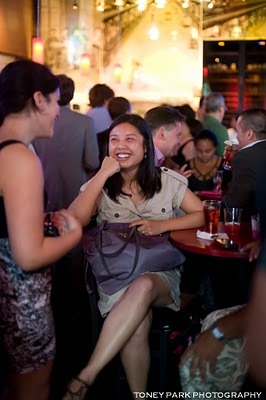 Guests sipped cocktails, ate Bellinis courtesy of Cipriani Downtown and received a 30% discount off select merchandise. The jeans superbly exhibited by the models were the epitome of quality and style. They are constructed with Italian Candiani selvedge denim and lined with the same fine fabrics used in Domenico Vacca’s dress shirts. Domenico Vacca Denim also uses hand construction to create the wash and destruction of every pair of jeans. A far cry from the work trousers created in 1873, a pair of jeans has become a must have item in every one’s wardrobe. Domenico Vacca Denim is sure to raise the bar yet again. Exclusive behind the scences photos of the SABIT NYC photo shoot at G Studios NYC. Upon walking through the threshold of SABIT NYC’s showroom on West 38th Street, I sensed an extreme aura of comfortability – a word not generally associated with the hectic, fast-paced, stressful world of fashion. As Shoichi Amemiya, head designer of SABIT NYC, stood to shake my hand I noticed his muted smile and quiet demeanor, which remained as I silently watched him work on his Apple laptop and check his Blackberry. He seemed unaffected as George Boria snapped shot after shot and appeared more than accommodating when George ask him to pose in front of a rack of his jeans. As he stood stoic in front of his creations, it became apparent that he is the anchor in this sea of tranquility. Life has many pleasures and many paths in which to seek it. Some people would not include their 9-5 on their list of delights, not so with Shoichi Amemiya and his team. The pleasure that Mr. Amemiya takes in what he does is evident in the philosophy of his brand as well as the clothing he produces. Since the establishment its in 2005, SABIT NYC has swept the fashion world like a tsunami, taking no prisoners in its rise to becoming one of the most influential and sought after urban brands on the market. SABIT NYC’s unique, eye catching designs has brought a bevy of A-listers to his door including Lil Wayne, T Pain, Mario, T.I., Juelz Santana and Swizz Beatz (the face of SABIT). F.A.M.E NYC had the opportunity to ask the amiable head designer of SABIT NYC a few questions about his philosophy and why enjoyment is the name of the game for this clothing brand. I am a Japanese native. I came to New York City 20 years ago. I attended a fashion school in Japan named Osaka Mode. How did you begin designing clothes? At age 17 I begin focusing on a fashion career. Shortly afterwards I went to school where I majored in Fashion Design. What made you want to design urban fashion in particular? My focus isn’t “urban” fashion; SABIT is an uncategorized brand. I design clothing that reflects the “lifestyle” of fashion. I have a great appreciation for hip hop and its culture. I fuse all elements of what’s hot and make it dope! Tell me more about your philosophy and how you apply it to your brand and your designs? My philosophy is Tanoshinde, a word in Japanese culture that means enjoy. I want my people to enjoy their life wearing SABIT. Every garment has “Tanoshinde” printed somewhere on it. How does the fashion and club scene in Tokyo influence your designs? The club scene in Tokyo doesn’t directly influence my design concepts; I never really paid much attention to it actually. However there is a fashion culture know in Japan as “AMACAJI”, which is the fusion of American casual and has become a major movement and the foundation by which most fashionable people in Japan dress. Why do you believe your designs have taken off like wild fire in the streets? I believe the world is looking for the newest, hottest style. Everyone is tired of the same brands and design concepts. SABIT NYC is [the] answer, fashionable and unique. Your clientele consists of some of the hottest MCs and R&B singers in the music industry. How does hip hop and R&B influence you? I believe hip hop has its influence but it doesn’t directly influence myself or my brand. I love music, so I can say that all genres play a major part in my design concepts. Could you tell me how Swizz Beatz came to be the face of SABIT NYC? Urban fashion, like hip hop, changes very frequently. Urban clothing brands hit a peak and then fade in popularity. 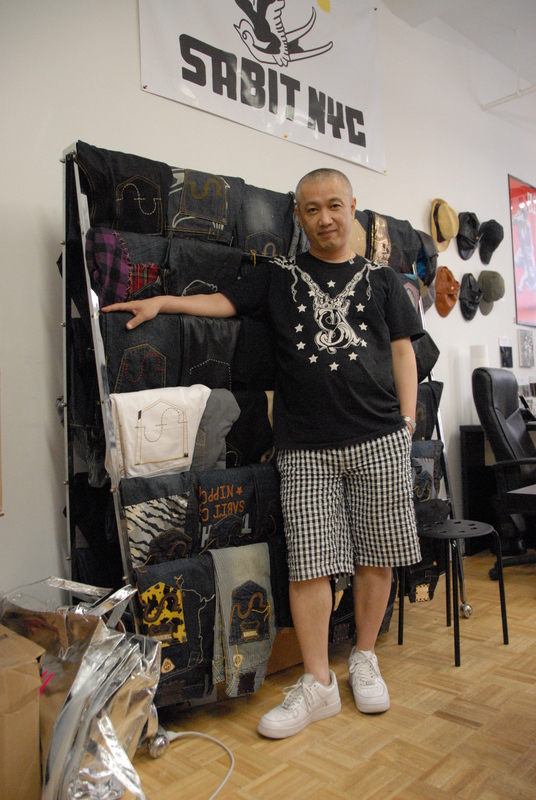 How will SABIT NYC avoid becoming a hip hop fad? Honestly we are not trying to “peak” in the urban market. We will remain relevant to the time, I understand that fashion is a language and continues to evolve, and as a designer I enjoy the challenges of having to stay fresh and always in fashion. Gianni Versace used the Medusa. There are a few symbols that are used frequently in your clothing. Could you tell me more about the effect these symbols have had on you and why you choose to use them? Our symbol is a bird in Japan called a “swallow.” In Asian culture this bird is considered lucky. So we consider our space its nest, a place where only luck can reside. What can we expect to see from SABIT NYC this September? Wow, Fashion Week is going to be great. Expect to see a very exciting collection with a few Native American elements such as beaded logo fabrications and leather trims fused into a collection filled with classic styles and fashion forward design concepts. Will you add a female line and other accessories soon? Yes, we are currently working on that now. However when the time is right, and only when it’s right will we move forward with that collection. Fashion is all about timing and making sure we are producing the highest levels of quality and style. What is next for Shoichi Amemiya? My hope is to spread the word “Tanoshide” to the world, giving them a part of my culture to hold on to. They may never go to Japan, but understanding my culture and where I’ve come from is most important to me. Juelz SantanaLil WayneMarioMen's FashionSABIT NYCShoichi AmemiyaSwizz BeatzT PainT.I. A few months ago I told you about Models International’s Fresh Face Model Search. Models submitted their pictures and on June 25 the announcement was made. 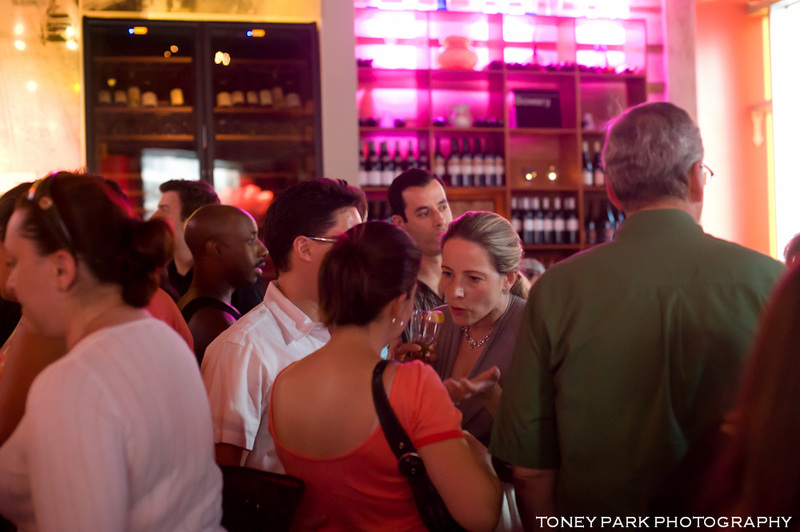 The fashionable of New York City ventured to Bowery Wine Co., located at 13 East 1st Street, to meet the latest additions to the Models International family. The winner of Models International’s Fresh Face Search 2010 is Whitney Heleker. Whitney is a 5’10, Botticelliesque beauty with an athletic frame, pouty mouth, bedroom eyes and a charming disposition. “Whitney is really someone that is youthful and has a face that you’re happy to look at. To me she has a great crossover look. She can do high fashion and she can do commercials as well,” Catherine stated about their one of their newest and freshest faces. Whitney described the night as “very exciting.” After seeing the posting for the search on ModelMayhem.com, Whitney submitted for the contest; the rest, as they say is history. Originally from Idaho, modeling was not a career path she thought about pursuing. Whitney played sports, varsity basketball and swimming (which served in helping her achieve her healthy body). It was not until traveling to California for college that the idea of modeling became a viable prospect. “People said to me, ‘Oh, you should model’,” Whitney recalled. At the time of the event Whitney had just arrived in Manhattan with total support from her family and was anxious to see the Empire State Building. Alongside Whitney, Models International also introduced other male and female models from their Fresh Faces board. They mixed and mingled with other guests as everyone tasted Italian-styled canapés and sipped on Sobieski Vodka concoctions. Another fresh face I met that night was Chad Silberman. Unlike Whitney, Chad did not have to travel very far to get to the Models Internationals office in New York, he hails from Long Island. “I have been interested in modeling for a while,” Chad admitted as we stood outside the Bowery Wine Co. to take in some of the humidity of a New York City summer evening. “I came across Models International’s blog and read about the search and a couple weeks later I got an email asking me to come into their offices.” Chad’s All-American good looks scream to be seen in a Lacoste, Nautica or Polo campaign. Not just a pretty face, Chad is studying to receive his Bachelor’s in Engineering. Another interesting fact I learned about Chad is he has a tattoo on the inside of his bottom lip. Andrienne Kennedy, Director of Models International Women’s board, stated that Models International has completed approximately five model searches in the past. “It is a really good way to find fresh faces and girls who are not in the industry, but may want to get in the industry and it is a great way to reach out to different parts of the country and find girls who are new to the business,” she stated. To get the girls ready for their new career, Models International provides their fresh faces with coaching to ensure they receive proper knowledge about the “ins and outs” of the business. Since beginning the program Andrienne said the fresh face models fare “very well.” With the new crop of dynamic visages that have been presented we are sure to see some new stars rising from the runways very soon. There is something about a puppet show that seems to resonate with the child in all of us. Regardless if you are seven or 70, live in a penthouse or a one bedroom walk up or are mother and father of 10 or singles looking to relive your childhood for just a brief moment, a puppet show equalizes all playing fields with smiles and laughter. And pure joy is what awaits anyone that spends 50 minutes in the undersea world that John Tartaglia creates. John Tartaglia’s Imaginocean! is a delightful sub-aquatic excursion that brings the three dimensional world of the deep to life with a musical that is treat for children and adults. The main characters in this romp of currents and discovery are a fish named Dorsel, his sister Bubbles and their friend Tank. Through their quest for treasure these friends find more than money, they meet new friends and learn lifelong lessons. The freshness of John Tartaglia’s Imaginocean! 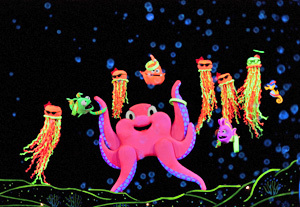 comes in the form of black-light, which makes the color puppets pop and become animated. The audience feels as if they are below the depths of the sea with the fishy friends and experience every laugh, song and dance in a much livelier way than other puppet productions. Filled with good music and good times, John Tartaglia’s Imaginocean! is one of off-Broadway’s best productions for a family. This show is smart, innovative and cool, I have no doubt it will continue to swim in a wave of success. 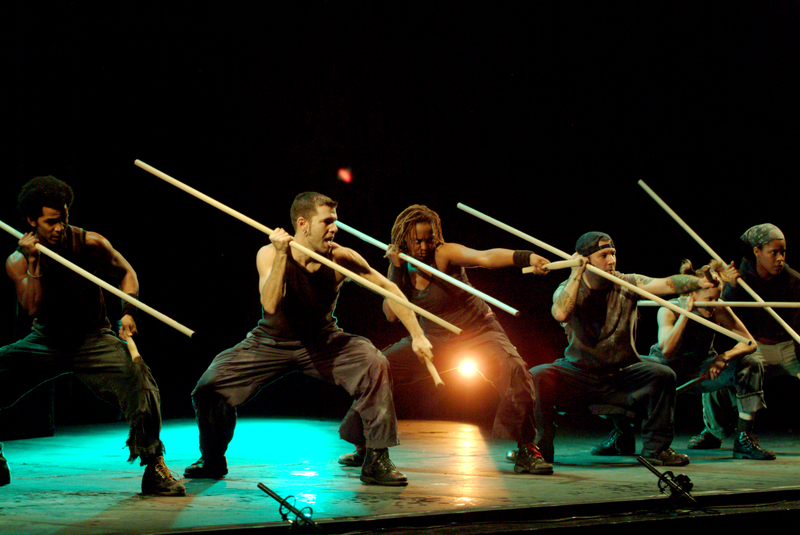 Thumping, bumping, jumping, banging, crashing, ripping, prancing, dancing and running literally, Stomp has been entertaining audiences at the Orpheum Theatre since 1994 and is one of the theatre world’s longest running productions. It is also one of the world’s most recognizable productions. 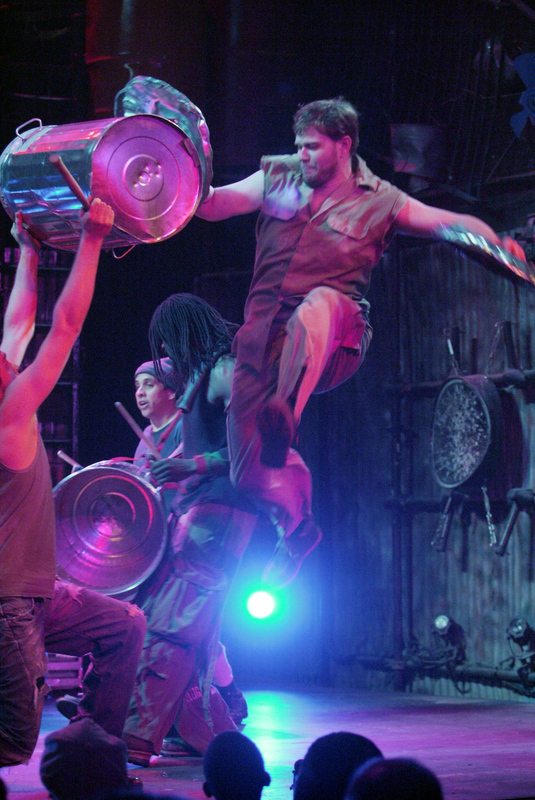 Stomp is an anomalous theatrical sensation that unifies its cast and the audience through rhythm, energy and movement. This non-traditional dance collective was created in the U.K. by Steve McNicholas and Luke Cresswell after first working together in 1981. 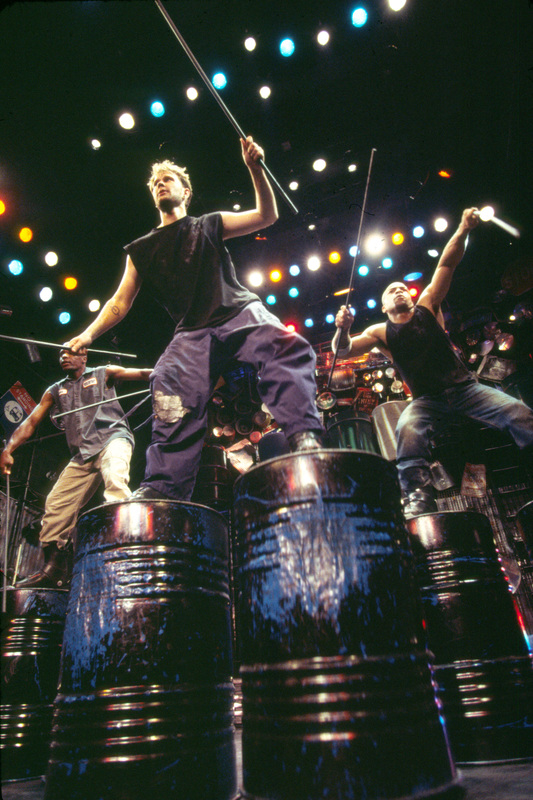 In the summer of 1991, a decade after their initial union, Stomp premiered at Edinburgh’s Assembly Rooms. From 1991 through 1994 the original cast, which had been expanded to 30 members, brought this unique multi-dimensional experience to audiences in Sydney, Hong Kong, Barcelona and Dublin, and also began its run in New York. 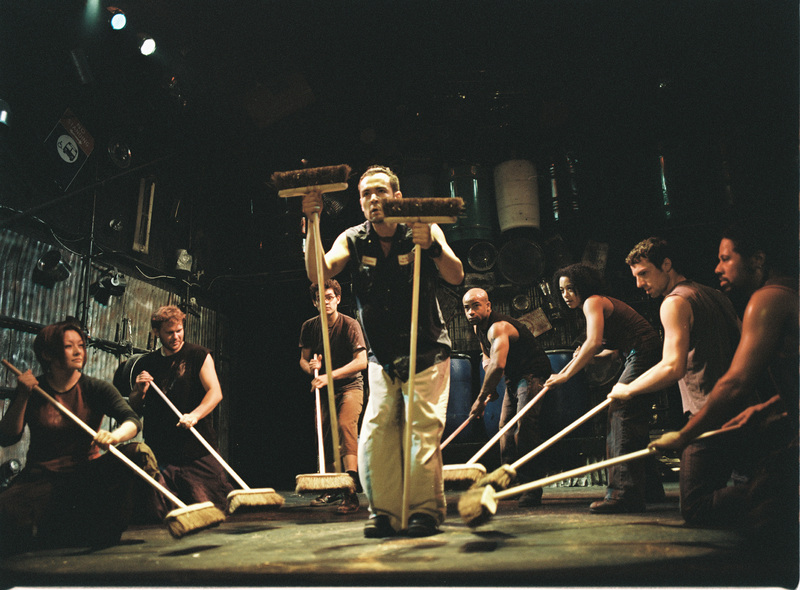 Currently, Stomp is still running in the U.K. and Manhattan and has tours in the U.S., Europe and Japan. 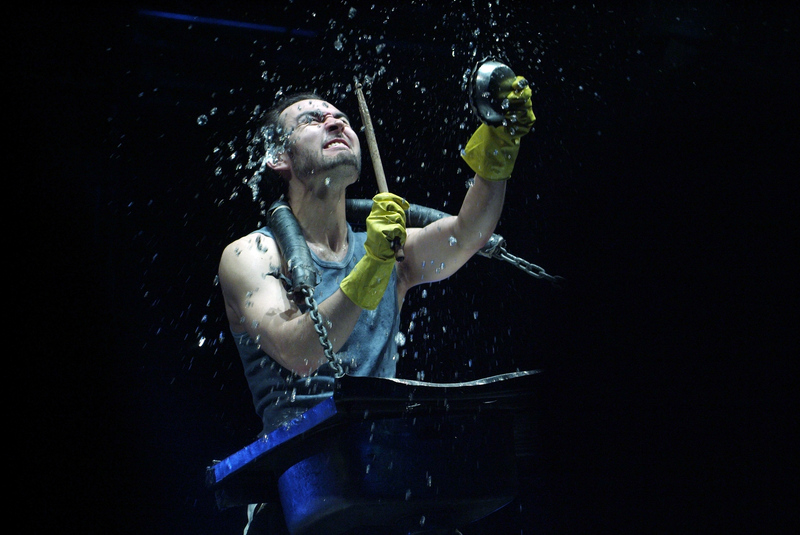 After 19 years abroad and 16 in New York City in particular, Stomp continues to wow audiences with its dynamic brand of performance theatre. Last weekend I decided to start of my July 4th celebration by finally seeing this production for myself. Sure, after all the buzz Stomp has created over the years I have seen excerpts of performances on television, but nothing is like seeing the real thing live. I was not prepared for the stunts I saw. Talk about spectacle …Macy’s 4th of July fireworks looked like a Lite-Brite exhibition compared to the electrifying commotion displayed on stage. The walls of the Orpheum Theatre were littered with a hodgepodge of discarded items included traffic, subway and street signs, huge plastic garbage cans, fans, pipes, mannequin tops and bottoms, fans, hub caps, ski boots, car grills and computer keyboards. The components, dilapidated and carefully hung on the walls, appear to regain their value and look more like a collage about movement and the way humans interact with inanimate objects than a bunch of junk. The show runs without an intermission and is a mind-bending ride of pure adrenaline. There is no dialogue, recognizable musical score or traditional choreography. But there is plenty of synchronized velocity. The show has a rotating cast and unlike some productions the sum of the cast’s vivacious exchange on stage is greater than its parts. Using their feet, hands, pipes, sinks, plastic bags aluminum trash cans and lids, newspapers, matchboxes, brooms and Zippo lighters, the cast turn random objects into a symphony of beats even getting the audience involved. Through clapping and snapping of fingers and hands, the swapping of energy comes full circle and the cast and audience becomes one. At its core, Stomp is about fusing diversity and commonality. The dancing and music that is created possesses a very tribal feel and through the rhythmic and comedic elements in the show the audience realizes that no matter where we come from, we are all from the human tribe. A revolution then and a revolution now, Stomp is still one of the most unique theatre experiences on off-Broadway. Entertaining on multiple levels, great for families as well as couples and singles, Stomp is a shot of fun made for everyone. After experiencing it for myself, I completely understand why this pulsating production has had such longevity. If all these sci-fi films are correct and space is the final frontier, I predict Stomp and its many incarnations will still be around clanging on hulls of old spacecrafts and bouncing on crevices of the moon.